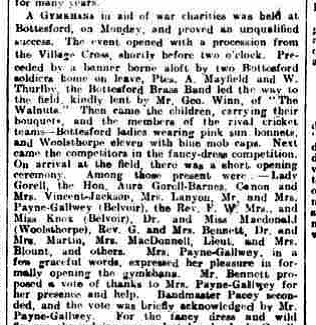 Grantham Journal, report of a Gymkhana held in Bottesford, 11th August 1917. Grantham Journal, report of a case at the Belvoir Police Court, 6th August 1924. Research of articles in the Grantham Journal published in 1917 formed the basis of the following extract from the account of Bottesford during WW1 written by Catherine Pugh: “The third anniversary of the outbreak of war was marked by special church services on Sunday August 5th and on Bank Holiday Monday by the Gymkhana in aid of war charities. At 2 0’clock the parade set off from the Cross. It was led by Privates Mayfield and Thurlby carrying a banner, followed by the Bottesford Brass Band and after them, in order, the children with bouquets, the rival cricket teams and the fancy dress competitors.” Arthur Mayfield was one of those who lost his life near Arras on the 7th October 1918, almost in the final month of the war, and is commemorated on Bottesford War Memorial, but what can we say about Private William Thurlby? William Thurlby was not added to the list of 184 Bottesford Servicemen that was discovered in the 1995 behind the organ in Bottesford Parish Church, nor does his name appear on the Methodist Roll of Honour or on the list of Absentee Voters. He was certainly living in the village in the Spring of 1919, in that he is recorded on the Register of Electors in the Parish of Bottesford, with the letters NM (Naval and Military). In this, William and Sarah Ann Thurlby living were living on Chapel Street, and also Harris Thorlby (probably his uncle) was living on his own in Easthorpe. Harris and Fanny Thurlby – The 1911 census of Bottesford recorded that Harris and Fanny Thorlby lived on Easthorpe Lane. Harris Thorlby was a 52 years old ironstone labourer from Helpringham in Lincolnshire; Fanny aged 50 came from Woolsthorpe by Belvoir. No children were recorded. They had also been recorded in the census of 1901, living on ‘Belvoir Road’, which was the name then used for what is now Castle View Road in Easthorpe (not to be confused with the present day Belvoir Road in Bottesford). There is no mention of any children in either of these censuses, but it could be that they had a son William who had moved away from his parent’s home. The couple were not in the 1891 census of Bottesford. 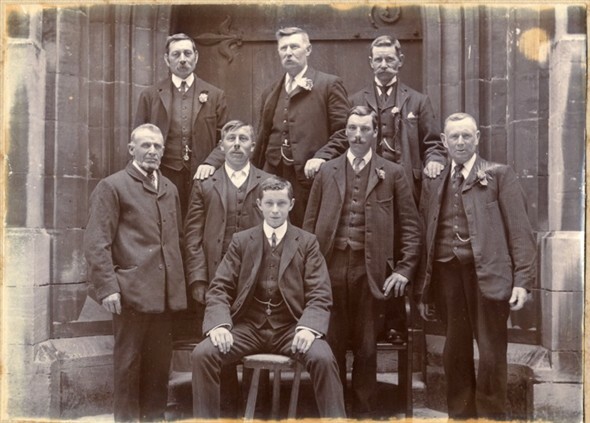 Harris Thurlby (or Thorlby) is seen in a picture of the St Mary’s bellringers taken in 1911 (back row on the right). He was born in 1858, the fifth of six sons named in the 1861 census of an agricultural labourer, William Thorlby, born in 1829 at Helpringham, Lincolnshire, and his wife Elizabeth, born in 1831 at Little Hale, Lincolnshire. No census records for him have been located in the censuses of 1881 and 1891, but he was living in Easthorpe by 1901. Harris Thorlby died at Daventry in 1944. William Thurlby of Bottesford – Records of William Thurlby’s family origin are a little confusing, in that there are two BMD records of boys named William Thorlby born in the Helpringham area, near Sleaford, one in 1880, the second in 1883 (not to mention other boys of this name born in the Nottingham area and elsewhere during the 1880s). Additional census data confirm that there were indeed two separate births in the Sleaford area. One of these was almost certainly the man who carried the banner in the Bottesford Gymkhana in 1917. The other went to live at Worksop, but the two came from villages near to each other, and they may well have been related. In the Census of 1861 is the record of the family of William Thorlby of Helpringham, Lincolnshire. There were William Thorlby (b.1829 at Helpringham) and Elizabeth Thorlby (b.1831 at Little Hale, near Helpringham), and their children James (b.1851), John (b.1852), William (b.1854), Harris (b.1858) and five others. This Harris Thorlby was most probably the man who was living in Bottesford in 1901 and 1911. Interestingly, William Thorlby senior may have been a brother of Mary Ann Parthina Thurlby, whose grandson was Albert Thurlby Scoffins, one of the 184 Bottesford survivors named on the ‘church list’. In the 1901 Census we located the family of John Thorlby, b.1852, at Thorpe Latimer, near Helpringham. This was almost certainly Harris Thorlby’s older brother, the second son of William and Elizabeth. The family comprised John (b.1852 at Helpringham), Matilda Thorlby (b.1858 at Horncastle), and five children named George (b.1881 at Helpringham), William (b.1883 Helpringham), Anne (b.1887 at Little Hale, where their grandmother came from), Kate (b.1889 at Little Hale), and John (b.1894 at Little Hale). John senior was a farm foreman; William and his older brother George were both employed as farm horsemen. William Thurlby (the names Thorlby and Thurlby appear to have been interchangeable) married a woman called either Sarah Ann Upton or Sarah Ann Edwards in 1901 or 1903 (The marriage records are slightly confusing with regard to both her maiden name and the wedding date, and have not been resolved in the absence of the marriage certificate). Harris Thorlby was William’s uncle, not his father. It seems probable that William and Sarah came to live in or near Bottesford at some time after 1901 and that William may conceivably have found work on a farm in Bottesford with with his uncle’s help. The ‘other’ William Thurlby – Returning to the 1891 census, we find that the ‘other’ William Thorlby was born in about 1881 (in fact the 1939 Register gave his birth date as 17th May, 1880) at Ewerby, near Helpringham, the second oldest child of Edwin and Lucy Anne Thorlby. Edwin was an agricultural labourer born at Helpringham in 1846, and Lucy Anne was born in 1849 also at Helpringham. Their home in 1891 was at Swaton, near Sleaford. By 1901, this William Thorlby was already working, as a waggoner on a farm at Ewerby. By 1911 he was a farm labourer at Gateford, Worksop, married to Lucy (b.1884 at Bawtry), and there were four children between 7 and 2 years old. They were still at Gateford in 1939, and William died in 1958 at Worksop. A number of military records for men called William Thurlby have been located, though none have been firmly connected with Bottesford. One is the attestation in 1899 (Boer War) at Derby of William Thurlby, aged 18 years 11 months, 8468 Grenadier Guards. This would be a good age fit, but he described himself as a maltster from Coddington, near Newark, and is therefore unlikely to be the man we are looking for. Another record is of the attestation in 1903 of William Thurlby, 9574 4th Battalion Sherwood Foresters, a labourer from Sneinton, Nottingham. This was probably the same William Thurlby as is found in the WW1 service record and Medal Index Card for M2/048090, Private, 22nd Army Service Corps. This William Thurlby also came from Sneinton. He gave his home address as 15, Windmill Lane (later changed to 15, Dale Street), Sneinton, and his wife’s name as Ellen Kelham. It seems probable that the man who originally attested in 1903, re-enlisted in 1915 as a motor mechanic, fitter and driver in the ASC in the British Expeditionary Force. He was reclassified as a coppersmith in 1918 and finally transferred to reserves in August 1919. However, he is clearly not the man from Bottesford. Two other WW1 Medal Index Cards were found. One is for a William Thurlby, Private 61629, Lincolnshire Regiment. Another is for William Thurlby, Warrant Officer Class 2, Nottinghamshire and Derbyshire Regiment. Nothing links any of these men definitively to Bottesford. 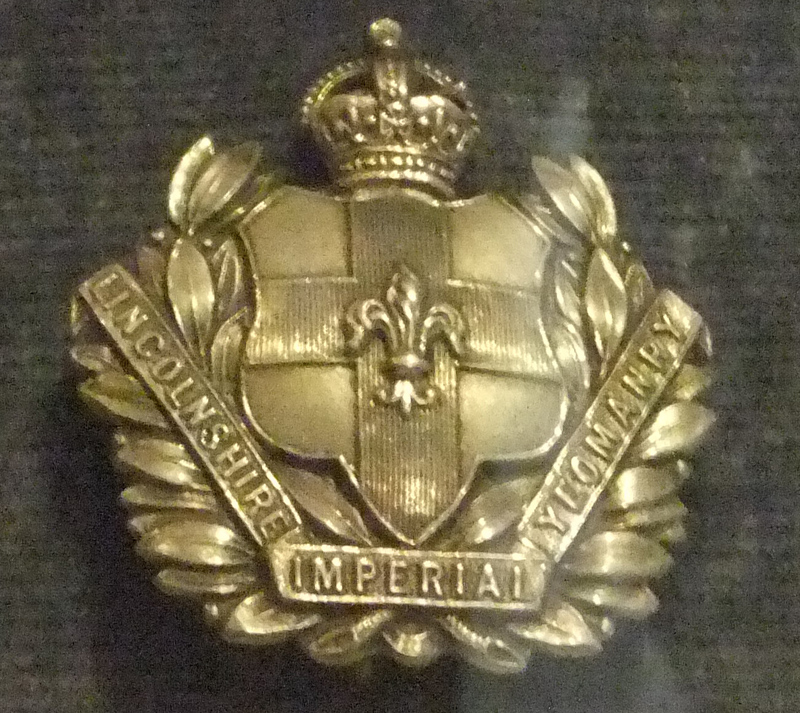 However, another possible clue comes from an article published by the Grantham Journal on the 5th February, 1910, entitled ‘Lincolnshire Imperial Yeomanry, “A” Squadron Ball at Grantham’ which lists Mrs W. Thurlby as one of those present. The ‘Long Long Trail’ website states that this regiment was created on formation of the Territorial Force in April 1908, and that its ‘A’ Squadron had its barracks at Grantham. It is possible that William Thurlby, an experienced farm horse-man, could have joined this regiment in or before 1910, and then been called up after the war broke out. He might then have become the private in the Lincolnshires whose MIC has been located, and it is this record that is tentatively given in this account. 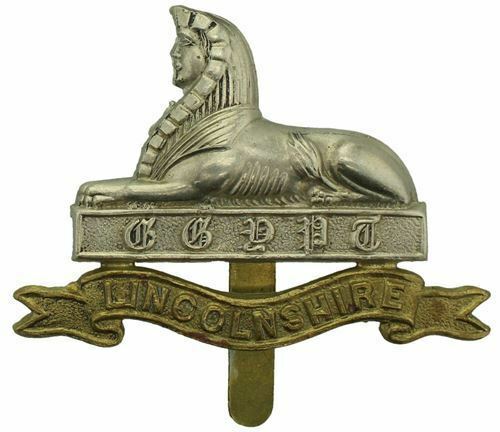 Alternatively, he may have remained in the Yeomanry, which was dispatched to Egypt in 1915 and fought in Palestine, but we have no record that would indicate that this is what he actually did. After his service career, William Thurlby returned to Bottesford and lived with Sarah and their family briefly on Chapel Street before moving to Debdale Farm, where they stayed until 1929. No records of the couple have been located in the Registers of Electors for 1920 or 1921, but there are records which indicate that from 1922 to 1929 William and Sarah Ann Thurlby lived at Debdale Farm, Bottesford, and from 1926 to 1929 there was also Thomas William Thurlby at Debdale Farm, probably their son. However, Sarah died in 1930, and in the Electoral Registers for 1930 and 1931 there are no more records of Thurlbys in Bottesford. Debdale Farm, Bottesford, was a relatively isolated building in the fields in the SW edge of the parish, near to Redmile (as distinct from Debdale Farm, Muston, which lay in the northern part of Muston Parish). An interesting anecdote is provided by the Grantham Journal, which the 6th August 1924 reported proceedings at the Belvoir Police Court, preside over by the Duke of Rutland, where one of the cases concerned “Damage to a Pear Tree at Bottesford”. 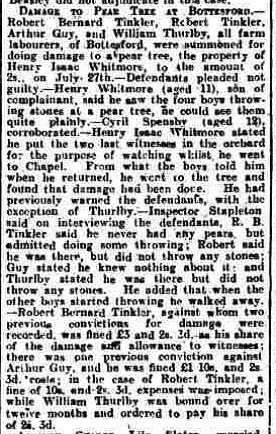 The tree, which belonged to Mr Henry Whitmore, suffered damage to the amount of 2s 3d. Four farm labourers were summoned: Robert Bernard Tinkler, Robert Tinkler, Arthur Guy and William Thurlby. William was bound over for twelve months and ordered to pay his share of the 2s 3d. It is hard to believe that this was 44 years old ex-serviceman, but it could have been his son. Times were hard, and the pears might well have been a tempting target. On the 8th November 1930 the Grantham Journal reported the “Sudden Death of Mrs Sarah Ann Thurlby, 40, wife of William Thurlby a farm waggoner, of Debdale Farm, Bottesford. There is no record in the 1939 Register, suggesting that he had died by this time, but no record of his death or burial has been located. This is a tentative identification that has not been confirmed. It is hoped that additional records will be located that will allow it to be confirmed or revised as necessary.